Last week the Class of 2017 visited the National 9/11 Memorial Museum. 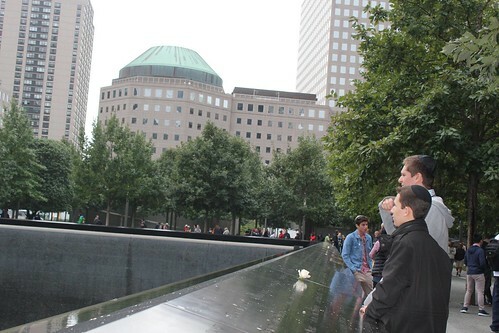 Each year the senior class visits Ground Zero and experiences the inspirational and moving tribute to the events that took place on September 11. 2001. In school, we were introduced to the day by watching a recap of all the events that took place because we were too young to remember what had occurred. There was not a sound in the room while we watched a video about the event. 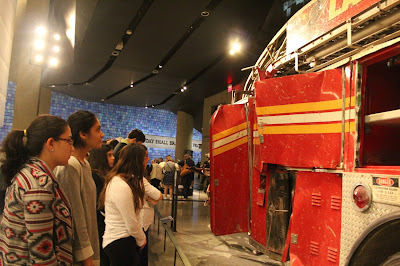 In the museum, we looked at artifacts and pictures and watched videos about the tragic event. The museum had everything from newspapers from the morning of the event to pieces of metal from the buildings' structures. Tears were in my eyes as I heard voicemail messages from the people who were on the planes to their loved ones during their final moments. One story that particularly touched me from a film in the museum was of a woman who made sure to hold her skirt down while jumping out of a building so that it wouldn't fly up. Her modesty amazes me. I couldn't believe the courage of the firemen and volunteers who continued going in to the buildings even when they were collapsing. We learned a lot of interesting things that we didn't know before. 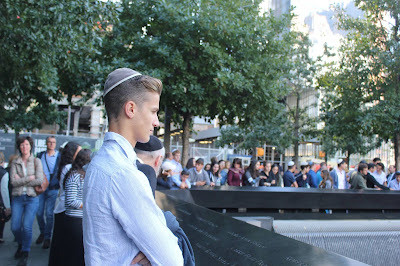 What happened on 9/11 and those who died will never be forgotten.